What brand of manual locking hubs do you use? What’s the best manual hubs to buy? × A place for more technical discussions. Please make sure you post in the correct section on the site, this way it keeps the site tidy AND ensures you get a more relevant answer. Replied by Scimike on topic What brand of manual locking hubs do you use? What’s the best manual hubs to buy? Driving with the manual front hubs engaged spinning the front drive train should not cause any issues so long as the transfer box is in 2WD. It is possible that your fuel economy will be less due to the energy required to spin the metal, but I doubt it will be noticeable. Series Land Rovers operate the same way, ie they continually spin the front drive train. Manual locking Hubs being sold as an option on these to save fuel, rather that a fix for a vacuum system. Replied by kirkynut on topic What brand of manual locking hubs do you use? What’s the best manual hubs to buy? TomDK wrote: The SJ Aisin hubs does require a bit of work. But only takes 5 minutes to do. The unthreaded part of the bearing lock nut needs to be cut off. It's easy to do and doesn't do anything to how the nut holds the bearing on place. This does not work. Been there, tried it and found out it does not work. Replied by TomDK on topic What brand of manual locking hubs do you use? What’s the best manual hubs to buy? Works fine on my Jimny and many others with SJ manual hubs. +3" Trail Master. Fox 8.0" R/R shocks. ORA HD winchbumper. Warn M8274 Ox-motor + Hellfire gears, Delta-Tek mainshaft and freespool, overvolted. 33/9.5 R16 Silverstone Extreme. 5.14:1 ratio SJ transferbox in RW cradle. OMP rollcage. Replied by S200KYS on topic What brand of manual locking hubs do you use? What’s the best manual hubs to buy? The ‘average’ Jimny owner isn’t going to want to release the wheel bearings and then re-torque them up to be able to get the nut out to cut the lip off it though? Aisin SJ freewheeling hubs that I kept from my old SJ. Many others have found the same, which is why the spacers came about. It was partly my findings years ago, back not long after this forum started that spurred the production of the spacers. The production of hubs that need no spacers now has likely reduced the need for them. My wheel bearing nuts are cut down as much as they can be too. S200KYS wrote: The ‘average’ Jimny owner isn’t going to want to release the wheel bearings and then re-torque them up to be able to get the nut out to cut the lip off it though? And why bother when you can either buy spacers or hubs that just fit? Replied by NineCherries on topic What brand of manual locking hubs do you use? What’s the best manual hubs to buy? Well thanks for all the info guys. I settled on a set of avm 457hp reinforced hubs. Fitted onto car with no issues. Looks great and should be an end to my 4wd woes. Last edit: 04 Jul 2018 16:41 by NineCherries. Replied by Lambert on topic What brand of manual locking hubs do you use? What’s the best manual hubs to buy? Just be aware that the polished aluminium is a bare finish and corrosion is both inevitable and rapid without some maintenance or protection. I left mine though so that they're less eye catching to undesirables. Replied by Daniel30 on topic What brand of manual locking hubs do you use? What’s the best manual hubs to buy? 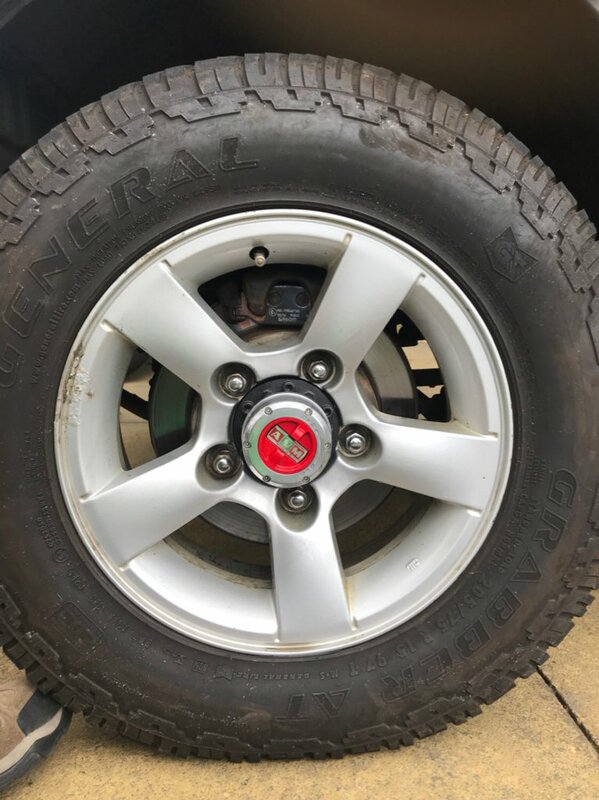 Replied by Bosanek on topic What brand of manual locking hubs do you use? What’s the best manual hubs to buy? Like the others have already attested, driving a Jimny with the front hub heads engaged will not harm the drive line on any surface, as long as the transfer box is in 2WD mode (front propeller shaft disengaged from the transfer box). Only the fuel consumption will be slightly affected. I wrote this large wiki article which deals extensively with the topic of fixed or manual vs. vacuum locking front wheel free wheeling hub heads. I mentioned in that article that trimming the front wheel bearing locking nut is one of the possible solutions for fitting an old Vitara or SJ41x manual hub head. But now I see that such a method is allegedly not feasible, while others claim that it is? Replied by Riccy on topic What brand of manual locking hubs do you use? What’s the best manual hubs to buy? Anyone removed the vacuum pipes off the front axle and kept them? My vacuum system still works, but when it stops I believe it will be the above pipes due to corrosion which are in a poor state for a 2009 vehicle. I want to keep the system "as is", but dont want to pay the £170 for a new pipe set. I believe I could manufacture new pipe sets a a fraction of the cost, but need a unbent set off a vehicle to act as a template. As mine still work they are not coming off just yet, but if someone has a set they would like to donate then maybe we can supply a better made alternative for those that wish to retain it. I am in Stoke-on-Trent and would collect within reason or pay postage (uk). Its not going to be a money making venture from my prospective, just a forum type supply possibility, so cheap and slow is my work ethic. Sorry to hijack this thread, but it feels like the correct place to ask as you have already decided to bin the vacuum system.